Numerous surveys and reports in recent years have found that around 70% of British volunteers are unhappy. The primary reason for not volunteering, or being unhappy with a voluntary role is that people have not been asked to do what they would like to do. It does not have to be this way! Successful volunteering is all about volunteer management, rather than volunteer recruitment, in much the same way that member retention is more critical for the size of the club than member recruitment. Gliding is already good at volunteering, yet clubs often report difficulty getting enough people to help out. getting agreement on what is involved in each role and how the volunteers will be supported. When these two areas are well defined, it becomes much easier for people to respond to an invitation to volunteer. ‘Healthy Volunteering’; introductory presentation from the 2017 BGA Club Management Conference. Having a Volunteer Coordinator to lead and support club volunteers will be helpful. Slides 18 & 19 in the ‘Healthy Volunteering’ presentation are relevant. When looking at recruiting new volunteers, it is important to understand what the capacity for supporting those volunteers is. Each new volunteer should have someone to show them the ropes and to be available to talk to about the role. A place where people are enjoying themselves becomes a place where other people want to join in – both as new club members and active volunteers. Gliding is volunteering. Understanding just how much donation-in-kind of people’s time is very helpful when it comes to project planning and future club management decision making. It could be helpful if the volunteer coordinator could gather volunteer hours. 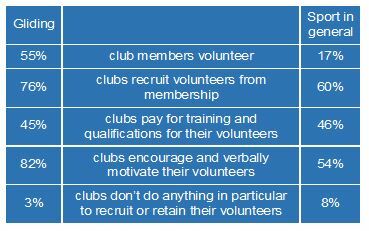 Ideally, your club will write and adopt a Volunteering Policy. The WCVA have an information sheet ‘Creating a volunteering policy’ which includes links to a copy of their model volunteering policy. The Sport and Recreation Alliance has provided a useful facility where clubs can advertise the type of volunteers they are looking for. Details are available here. As ever, the advice and guidance from WCVA is excellent. There is a WCVA publication Recruiting volunteers – a manual of good practice which, although published in 2005, is still highly relevant – volunteers are people and they haven’t changed much in that time. WCVA run Volunteering Wales, which has many useful resources. They are working with Team Kinetic to produce a website for volunteer management which will go live in June 2018. If you would like BGA support with developing healthy volunteering at your club, please contact the BGA Development Officer via the BGA Office.